INE has been pushing for increased use of alternative fuel in the transport sector, the company has had its main focus on Hydrogen applications and later there has been focus on battery vehicles. Here to the right you can get an overview of the main research of the company. The test driving in ECTOS and the CUTE projects were partially run simultainously where ECTOS started and ended earlier. During the demonstration surveys were carried out, technology was monitored and data was sampled. The outcome was then integrated in further work with this type of transportation systems in the HyFLEET:CUTE project. In Reykajvik there was no detailed efficinecy study made, but if you are interested in looking into the performance of subsystems and total fuel consumption on board this first generation of Hydrogen busses then please enjoy the outcome of the study made in Stockholm. The overall objective of ECTOS was to demonstrate the state-of-the-art hydrogen technology by running part of the public transport system with fuel cell busses within Reykjavík, Iceland. The energy chain is nearly CO2 free, because domestic geothermal and hydro-powered energy sources feed the national electricity grid and this is used to produce hydrogen. A hydrogen fuel station has been in operation since its inauguration and makes pure hydrogen for the ECTOS fuel cell buses and other vehicles that have been shown in Reykjavik on special occasions. The fuel cell busses are refuelled daily at the hydrogen station, therefore all transportation and extra handling is minimized and safety measures optimal. An emergency responce plan is in place and routine proceedures establised to minimize any risks. The main research objectives for these hydrogen fuel cell buss projects is to find a safe, logical and clean way to integrate hydrogen into the current energy system. They are formulated because of concern for the socio-economic and environmental aspects for an eventual shift to a hydrogen based modern society. The goals of ECTOS are to learn from doing – and gaining real experience from using hydrogen as a fuel. 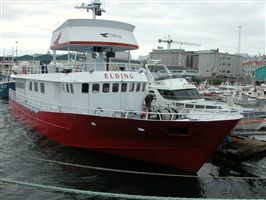 Based in Reykjavik, the Elding is a 125-ton well equipped cruiser for 150 passengers. The ship that is used for whale watching but was originally built as a resque boat and therefore it is an extremely stable. Hydrogen Fuel Cell as auxilliary power unit 2008 – 2010 as a part of the SMARTH2 project. The classification of the equipment demanded complex security specifications and it proved to be difficult to synchronise technical update and verification with schedules for tours which also depend on whether conditions.FC system that peaked output at 15kW using batteries as well. Icelandic Hydrogen (IceH2) was a key player is designing and installing the first fuel cell on a sea vessel, whereby the electrical system is operated by hydrogen generated electricity is from renewable sources. SMART-H2 was a project intended to introduce and integrate hydrogen vehicles to the general public. These include fuel cell vehicles and hydrogen ICE. In total twenty five cars have been delivered, while thirteen have been tested with varying degrees of success. For the future, the goal is to increase the number of vehicles in the Icelandic fleet and to fully understand the potential of hydrogen in a future society. INE and partners have been working on extensive data collections throughout the project and will continue to do so. There have been various types of hydrogen cars tested in Icelandic circumstances, see list here on the right and read more about different types of hydrogen vehicles. In July 2007 Daimler handed over the first vehicle to Icelandic New Energy. The FC-Aclass exceeded all expectations and performed well in Iceland‘s harsh climate. The second A-Class arrived two months after the delivery of the first vehicle. Both have been driven thousands of kilometers in Iceland and neither requiring any service. In late 2007 Quantum Technologies delivered 10 retrofitted hydrogen Prius vehicles. These vehicles were delivered to different customers, including energy companies like Reykjavik Energy (Landsvirkjun) and to Hertz car rental company. Early on the cold winter seemed to be affecting the vehicles due to water leaking into the oil causing certain malfunctions. In addition, the cars did not heat rapidly upon starting. To resolve this issue, two engine heaters were installed alleviating the earlier problem. However, customers who tested the vehicle indicated that the Prius was limited by its range of ~160 km which in turn affected the usage of the car. In total the vehicles have been driven more than 50,000 km to date and the car with the most milage is approaching 12,000 km. The car manufacturer Ford delivered eleven vehicles to Icelandic New Energy in April 2008 which was added to the Icelandic fleet, and in April 2009 the first full sized electric powered hydrogen fuel cell Ford Explorer was acquired. The Ford Focus vehicle was added to fleet in April 2008. By January 2010 15 Ford Focus Fc cars had been introduced to the traffic. Of those, 1 never started up after transport to iceland, probably due to frost damage underway, 1 has “given up” and one was crashed in a car accident. – Fortunately nothing happened to the driver and nothing to the fuel cell system either. The two cars that are out of order are currently a depot of spare part and function as to keep the others running. Like the two Daimler vehicles, the Ford has been driven roughly two thousand kilometers in Iceland without requiring any major service. The Ford Focus FCV is powered by a Ballard 902 Fuel Cell, Proton Exchange Membrane (PEM) stack. The car’s 5000 psi pressurized hydrogen tank releases H2 into the fuel cell stack where the hydrogen is temporarily separated into protons and electrons, producing electricity, then united with oxygen from the air to produce the vehicle’s only byproduct, water. The Ford Focus FCV is called a Generation 3 hydrogen car since other research cars have come before it, namely the Ford P2000 fuel cell vehicle, which still holds the record of traveling nearly 1,400 miles in a 24-hour period. The Ford Focus FCV is powered by electric motor and receives its electricity from two sources. The first source is directly from the fuel cell and the second source is from the H2 car’s battery pack (a module containing High Voltage SANYO Ni-MH Battery System). These vehicles may not freeze, – a feature that was overcome in later generations. The Ford Focus FCV has a driving range of approximately 150 – 200 miles and a top speed of 80 mph. The Focus FCV’s powertrain produces 170 ft-lb. torque and 87 bhp. The Ford Explorer Fuel Cell SUV boasts an impressive 350 miles per tank. The center-mounted hydrogen tank on the Ford Explorer Fuel Cell is placed where the 6-speed automatic transmission would normal go on the standard production version of the Ford Explorer. Ford is claiming that the Explorer Fuel Cell has a driving range of 350 miles (563 km) and that this exceeds any other fuel cell vehicle shown to date. Ford will need to tell this to their Japanese friends, however, as the Honda FCX also makes the same claim. The Ford Explorer FCV was built in cooperation with the U. S. Department of Energy, who continues to analyze the feasibility of hydrogen vehicles. The Ford Explorer Fuel Cell is a 6-passenger vehicle and has already undergone 17,000 miles (27.359 km) of road testing including setting a record of 1,556 miles (2.504 km)traveled in a 24-hour period. As an electric all-wheel-drive vehicle, the Ford Explorer FCV joins the ranks of Ford’s other green vehicles such as the Ford Escape Hybrid SUV and Mercury Mariner Hybrid SUV in delivering a sorely needed alternative to the group of low gas mileage, high emissions SUVs currently on the market. The Ford Flexible Series Edge was rolled on January 23, 2007 during the Washington DC Auto Show, just before President Bush’s State of the Union Address, which addresses the concerns of the North American automakers. As a plug-in hybrid electric vehicle (PHEV), the Ford Flexible Series Edge can run the first 25 miles entirely on battery power. Once the battery is 40-percent depleted, the Ballard fuel cell kicks in and recharges the 336-volt lithium ion battery pack, which in turn supplies current to the electric motor to drive the wheels. The 5,000 psi hydrogen tanks and fuel cell add 200 miles to the vehicle’s range for a total of 225 miles when combined with the battery pack. This range is somewhat deceiving, however, as it may vary widely by individual driver and driving habits. For instance, someone who drives only 25 miles per day will be able to drive on battery power only and recharge the battery pack at night for 8 hours with a 110-v or 220-v outlet before doing the same thing the next day. Those who drive 50 miles per day will receive the equivalent of 80 mpg. Those who drive the entire range of the vehicle in one day will get a combined city / highway mileage of 41 mpg. The Ford Flexible Series Edge can reach a top speed of 85 mph. The “flexible” part of the Ford Flexible Series Edge is that the fuel cell can be easily removed and replaced with a downsized gasoline or diesel engine. With this plug-in Ford Edge, the fuel cell size, weight and cost have been reduced by half and by using this type of hybrid system, the life of the fuel cell will be double the life of other fuel cells. In Iceland the Ford-Edge caught the attention of many with its ability to drive roughly 320 km on hydrogen and another 40-50 km on the batteries. Those who tested the car agreed that this platform could be the future and the ”dream car of Iceland” due to the combination of efficiency, long ranges, the fast refueling capabilities of hydrogen. Lithium-ion battery technology remains a significant cost hurdle, however. Both Ford and General Motors have asked the Federal Government for as much as $500 million for additional research and development on lithium-ion technology in order to bring the costs down within the next couple of years. Adapted from Hydrogen Cars Now 20 April 2009. There exists a variety of electric cars. Some run with batteries and an electric motor while others have a fuel cell on board and generate electricty from hydrogen. They also use electric motors. Both types are using the local electric grid as the main source of energy for filling up. Hydrogen is made with electricity and water, while batteries can store electricity directly. Icelandic New Energy has made arrangements to test Battery Electric Vehicles (BEV) within the Icelandic conditions. As before these vehicles are rented out to customers who are kindly requested to fill in forms as to register data about the cars’ performance in everyday usage. In 2010 two MiEVs were put in use and in 2011 the first Think car was put in traffic. Both of these cars use normal electric plugs and can be filled with cords to normal sockets, which are of the type 220V and 10, 12 or 16A in Iceland. In May 2010 two MiEV cars were imported from Mitsubishi in collaboration with the car retailer Hekla in Iceland. These vehicles are made for left side driving so it is a little odd to sit at the steering wheel. The cars were first used at the energy companies (the National Power Company and Reykjavík Energy) as well as the Icelandic Ministry of Industry and Commerce used one of the cars as the main car for the minister, Mrs Katrin Juliusdottir. Right away this sprinting red vehicle was nick-named the Strawberry. The other one is silver gray. The power train runs on 330 V but the car can either be charged with high power (fast charging) or from ordinary sockets. It contains two kinds of batteries, the main Li ion batteries (330) used for driving and an ordinary battery (12V) for auxilliary use. The car can seat 4 passengers and it is quite roomy on the inside and yet neat on the outside. Technical data is as follows: The motor is permanent cynchronous magnet technology. Max power; 47kW and max torque is 180Nm with a rear wheel drive. During 2011 and 2010 these two cars were used in service outside of the capital for example at the hydro-power station at Ljósafoss and in Akureyri. In spring 2011 the gray one was rented to the Faro Islands and will later that year also be rented to Greenland. In Reykjavik they have been in use by Reykjavik’s Energy (OR), and the National Power Company (LV) and also rented out to few families that have participated in our project: Electric vehicles for the public. All drivers have reported very nice driving performace but during cold spells the range is somewhat shorter than they expected, especially if the wipers, lights, radio and the heating is used to a large extent. More detailed information on the performance is to be published at the end of 2011. In February 2011 Icelandic New Energy borrowed a TH!NK car, arriving from Greenland where it had been undergoing drive test with good results. THINK cars have been widely used for example on Shetland and in the Orkneys, but they are produced in Finland and sold through Norway. This car exchange was a part of a project called El-Mobility. This vehicle was the third BEV used in the project in Iceland. Th!nk is designed by Norwegians but produced in Finland. The car has a front wheel drive and is powered by sodium-nickel-chloride batteries (ZEBRA Z36). These batteries differ substantially from the batteries used in the Mitsubishi iMiEV, mainly for the reason that these are high-temperature batteries that keep the temperature around 260-350°C.The vehicles are equipped with a 23 kWh battery pack and the electric motor has a maximum of 30 kW power (equals to ca. 40 horsepower).The car is registered range is maximum of 160 km (in summer time) and 90 km (in winter time) and it takes 8-9 hours to fully charge the vehicle.